What?? Porcupine?? It all started when my son was in first grade. Being known as the parent that could never say “no”, I was asked to chair the costume committee for the first grade play. We were given a t-shirt and baseball cap to match the color of each character. The characters ranged from cats to ducks and even a few squirrels. 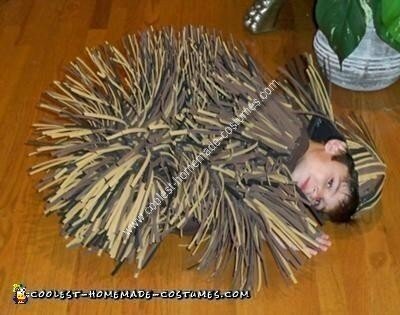 My son was lucky enough to be chosen to play the hedgehog. AKA porcupine. It didn’t seem like it would be an easy costume to make. 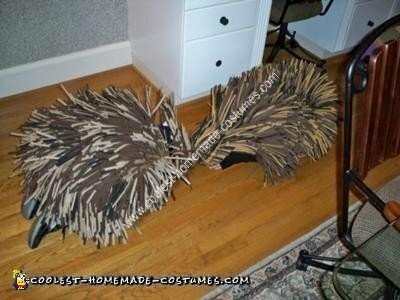 After much thought and a trip to the craft store, my plan for the Porcupine Costume came together. I purchased several pages of 8 1/2 by 11 foam sheets. They can be found in most craft stores and come is a variety of colors. I choose black, brown, tan, and mustard/clay colors. Using a paper cutter I cut the sheets into 8 1/2 by 1/4 inch strips. I layed the t-shirt down so that the back was facing upward. I placed a piece of cardboard inside the shirt to keep the glue from seeping through. Using the hot glue gun I began to glue the strips to the back of the shirt, so that they were sticking out/upward. Make sure to start at the edge of the sleeves so that they are covered with the strips as well. The hot glue gun works very well because it dries fast. I left about 1/4 inch between the strips and was sure to alternate the colors. Once the entire back of the shirt was complete, I then covered the hat with the same strips. It turned out to be fun and easy. The costume was such a hit that I had to make one for my other son. Just a tip.. Make sure that the t-shirt is a little oversized. Once you have finished the gluing and all is dry, you can cut a slit in the t-shirt hem and run a piece of elastic through it. This really adds to the effect. You can also use any old dark colored spray paint to dust the front of the shirt giving it an uneven colored effect. I am now the proud mom of two adorable porcupines. I hope you have as much fun with this as we did!! that’s really creative you did an awesome job!! Thank You.. We had so much fun with it.. 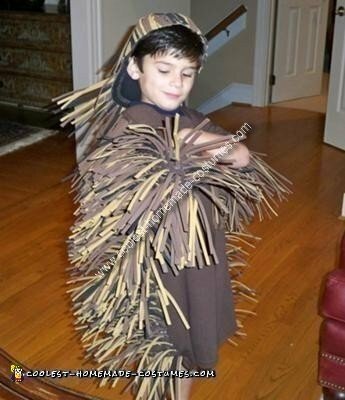 I need to make a porcupine costume and this is just wonderful Would you mind my asking…when you glued the foam strips on, how did you get them to stick out….did you fold the ends or just stick them flat? Also how many sheets of each foam color did you need. and how long did this take? Your idea saved my life! Very awesome. My 2nd Grade girl got tons of compliments from the kids, parents and teachers. It pretty much took a whole day’s worth of work (to cover an adult “M” t-shirt). And that’s with the husband pitching in as well. Thanks!!! truly creative and mind blowing. i have to convince my daughter for this, as she too has fancy dress competition in school. Thank you for this great idea! I love that you posted pics as well. This busy mom appreciates the step by step! 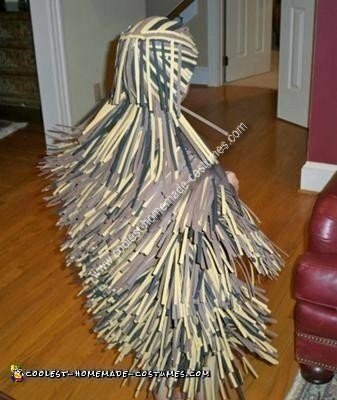 Great costume, making this for our son at the moment. Thanks for the clear instructions and lovely photos. I noticed that our foam sheets were described as ‘flammable’ on the packet – it’s quite an eye opener to put a match to a strip.